I am SO in love with the new Bo Bunny Altitude I Want It All Bundle from FotoBella!!! 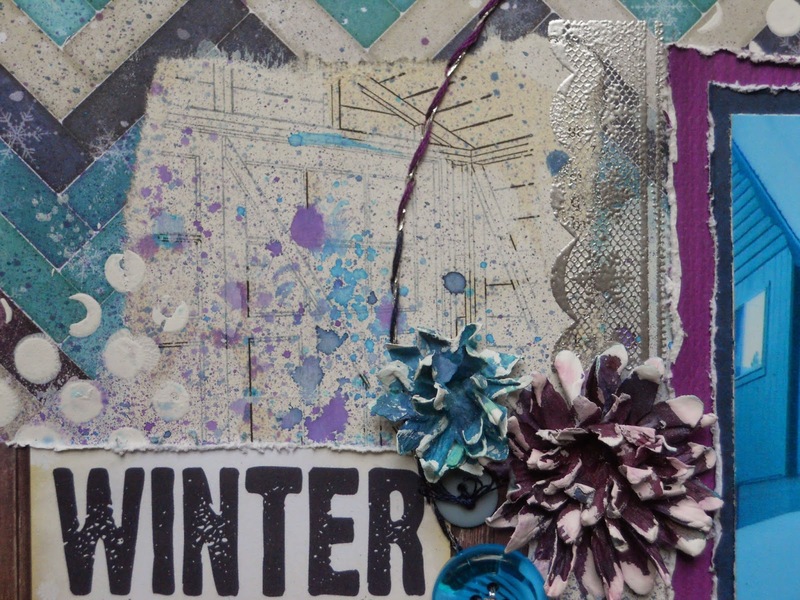 It's packed full of gorgeous goodies and colors for all of your winter photos and projects! I scrapped this photo of my house when I lived in Truckee, CA, with icicles so huge they actually hit the ground. 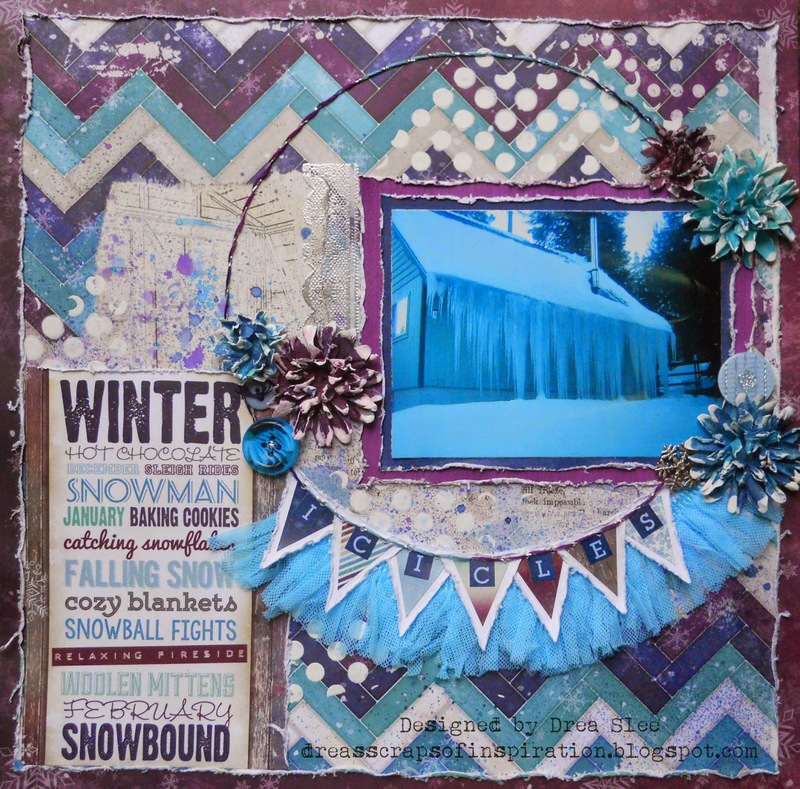 I started with the beautiful chevron paper (Cold Snap) that I got from the Collection Pack. Doesn't it look like a nice, cozy quilt? Then I pulled out my Ephemera Pack , which is full of smaller papers, trims, buttons, stickers, and other embellies, including a book page with an image of a house, that I tore around the edges, and glued onto my paper. I also tore some smaller strips of the script,and glued them along the bottom of my photo. Then I used a light coat of gesso to go over them, and sprayed some mists on top. Once it dried, I used some more gesso to mask the dots with a stencil. Next to the house image, I used silver embossing powder to stamp the lace scallops. I hand stitched the large circle in three different colors, and used silver thread to tie them all together. 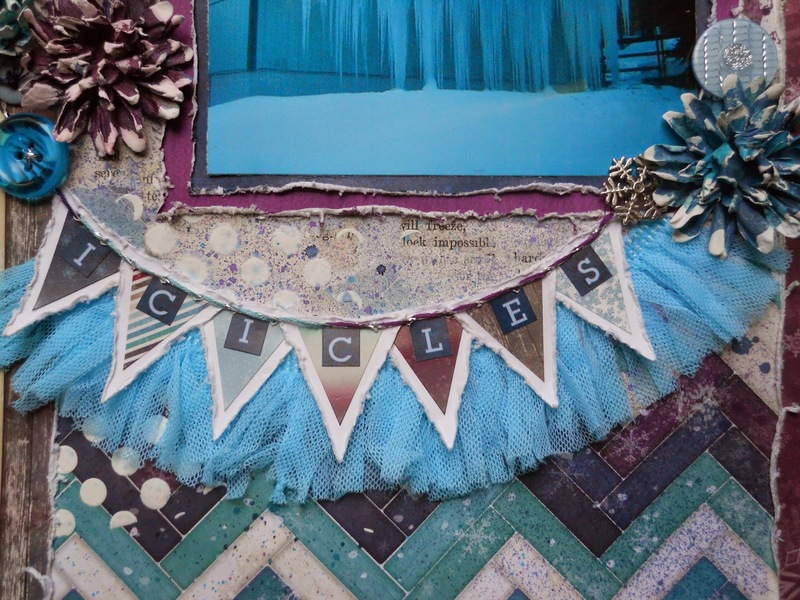 The banner was made from the stickers that come in the collection pack, and I used the stickers that come in the Ephemera pack, to spell out icicles, backing them with white, distressed cardstock. Under the banner I used the blue fringe trim that also comes in the Ephemera pack, along with the buttons and silver snowflake. The flowers were a package of flat aqua Kaiser Craft flowers that I had in my stash, which I misted, scrunched, and applied gesso to the ends of the petals. Thanks for looking, and be sure to pick up your own bundle! I don't think I've ever seen icicles quite that large! They're huge! This paper really looks good with that photograph too, it's just perfect!